This morning went to the nearby super market to get the vegetables and some other household articles. There in one corner was a huge stack of these double-yolk eggs. I couldn’t control myself and bought a whole dozen of them. While returning all through the street I was thinking of what to do with those eggs. For the special eggs there should be something very special. Whenever my mom gets tired of living in the kitchen, she tries out all possible shortcuts for dinner. “Dimer vada” is also one of her shortcuts too. It’s so easy to cook, yet it’s the so tasty. I just love the smell of it from the kitchen. So today I thought of making that myself with the special eggs from the market. Mash the potatoes and add the beaten eggs to it. Throw in the onions, chilli, turmeric pwder and salt. As the oil gets heated, make small discs out of your batter and fry. Serve as a wonderful starter with tomato sauce or just have it as a side dish with dal on your dinner table. Enjoy the great egg pakora. Catch you soon, till then happy cooking and happy eating. 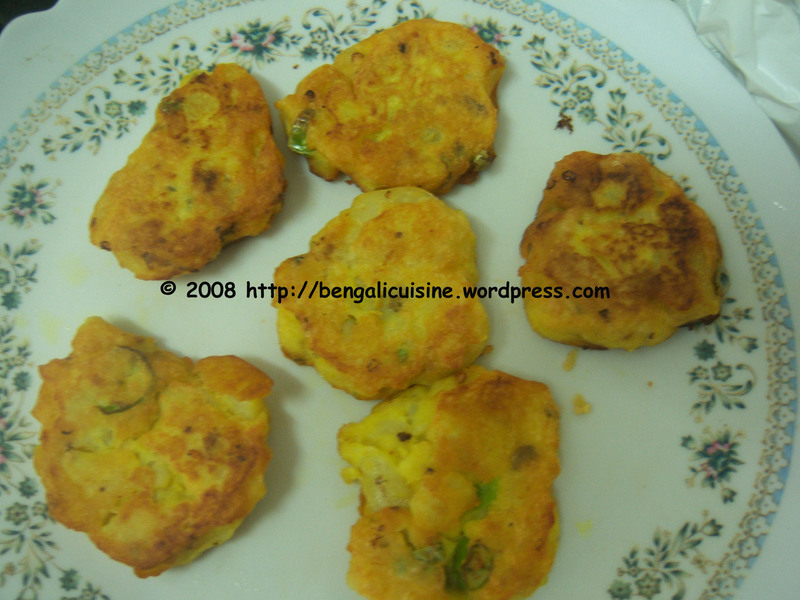 Dekhte daron, will try this sometime!